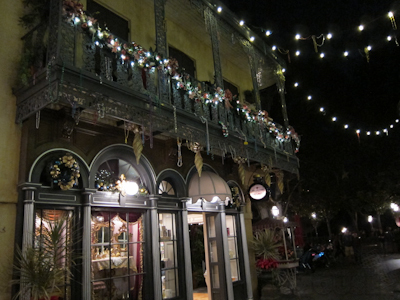 Over in New Orleans Square–you know, that area of the park I haven’t written ANYTHING about yet (My Year is a miserable failure, however, MYWTM is an astounding success–rock on! 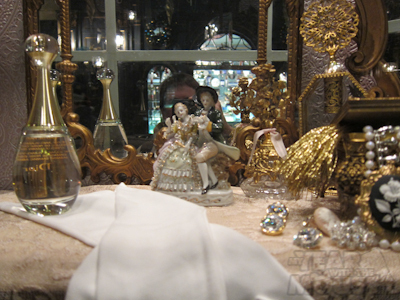 )–there’s a small, fragrant shop called Mlle. 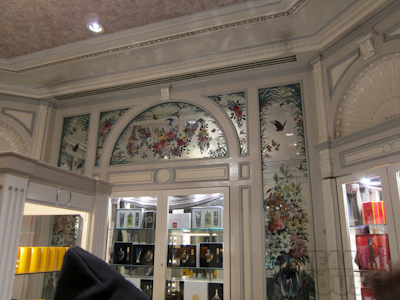 Antoinette’s Parfumerie. Mlle. 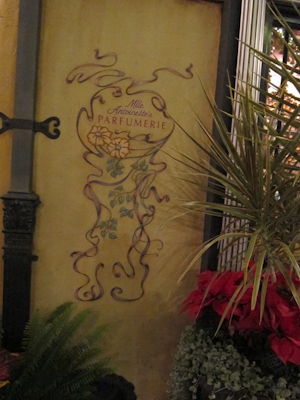 (which is the abbreviation for Mademoiselle, as all of my sophisticated readers undoubtedly already know) Antoinette’s Parfumerie is one of the original shops opened in New Orleans Square at the request of Lillian Disney, Walt’s wife. To be honest, I was feeling a bit sheepish because I had absolutely no memory of the Parfumerie. I felt much better when my Standard Research Method (3 minutes on Google) confirmed that the Parfumerie closed in the 90s when I was living in the Midwest and re-opened just this May. 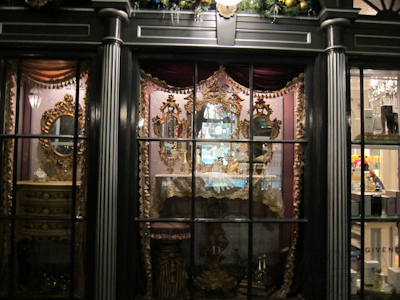 The inside of the shop is both cozy and extensively decorated. 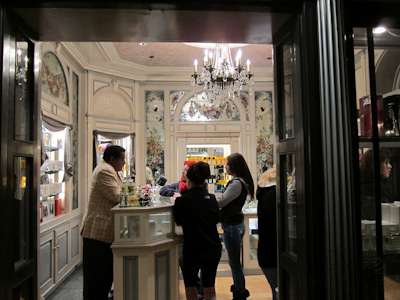 According to my SRM, the chandelier was selected by Lilly Disney herself, from a shop in the real New Orleans. Plus the mirrors are hand-painted with some technique where the back of the glass is painted and then it’s turned into a mirror. The shop carries normal perfume from companies like Dior, Givenchy, and other expensive perfumes I know nothing about because I don’t wear perfume. I wanted to talk to the cast member behind the counter, but these three girls talked to him forever. So I just gave up. But apparently the old perfume shop allowed you to mix and create your own signature scent, which sounds pretty cool to me, but this one does not. And supposedly there are either 2 or 3 perfumes that are “exclusive” to Disney (some say Disneyland, some say Disney Parks–this is where my SRM breaks down). Still, I wouldn’t recommend buying some and then going on, like, Space Mountain or something.